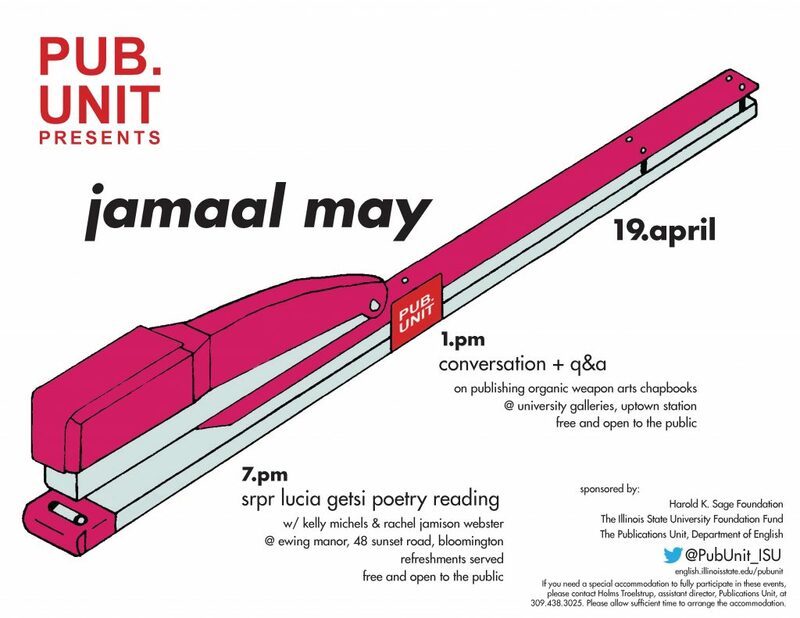 The Publications Unit is welcoming award-winning poet and publisher Jamaal May to Illinois State University on Thursday, April 19, 2018, as part of the PUB.UNIT Presents event series. At 1 p.m. at the University Galleries (Uptown Station), May will discuss his experiences as a writer and the founder, co-director, designer, and editor for the independent chapbook press Organic Weapon Arts, located in Detroit, Michigan. That evening, May will be a featured reader at the annual SRPR (Spoon River Poetry Review) Lucia Getsi Reading Series at 7 p.m. at Ewing Manor (48 Sunset Road, Bloomington; with Kelly Michels and Rachel Jamison Webster). Both events are free and open to the public. 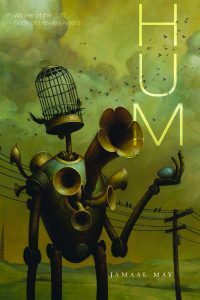 Jamaal May’s book Hum has won the Beatrice Hawley Award, the ALA Notable Book Award, and was a finalist for the NAACP Image award. 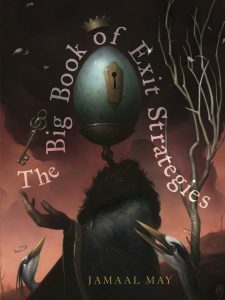 His second collection is The Big Book of Exit Strategies and he has also published two chapbooks, The God Engine and The Whetting of Teeth. His poetry has appeared in Poetry, The Believer, Ploughshares, New England Review and The Kenyon Review. He has also been a recipient of the Kenyon Review Fellowship at Kenyon College, Bread Loaf, Callaloo and the Civitella Ranieri Fellowship. 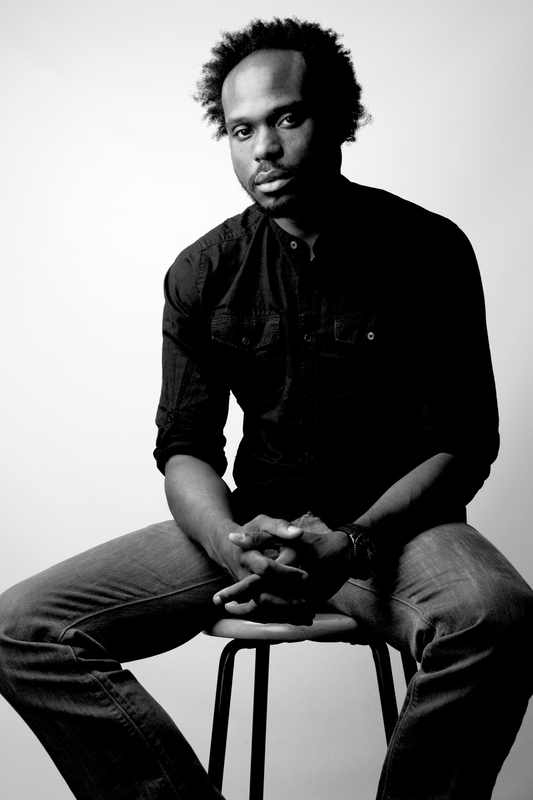 He is the series editor, graphic designer and filmmaker for the Organic Weapon Arts Chapbook and Video Series. In the spirit of the English studies model of the Department of English at ISU, which embraces the inherent interdisciplinarity of the field, PUB.UNIT Presents, sponsored by the Publications Unit, hosts noted writers-who-are-editors/editors-who-are-writers to talk about how embracing those dual roles impacts their work and careers. PUB.UNIT Presents has hosted internationally renowned writer-editors like Roxane Gay, Martin Glaz Serup, Christine Wertheim, Carrie Olivia Adams, Joel Craig, Shanna Compton, Peter Davis, Roberto Harrison, Brenda Cárdenas, Víctor Rodríguez Núñez, Katherine M. Hedeen, Danielle Dutton, and Johannas Göransson, and is excited to host Jamaal May this spring. This event is sponsored by the Harold K. Sage Foundation, the Illinois State University Foundation Fund, and the Publications Unit in the Department of English.